Andy Reid speaks on the week one victory over the Cleveland Browns. 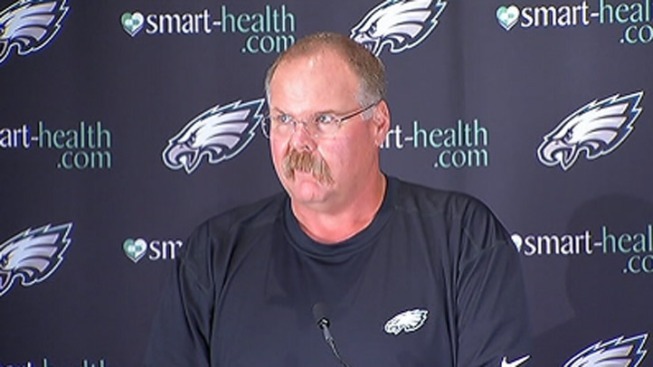 Eagles head coach Andy Reid spoke on the team's week one victory over the Cleveland Browns during a press conference at noon. Reid began the presser by addressing several injuries to key players. According to Reid, Jeremy Maclin suffered a right hip flexor strain during Sunday's game and is questionable for next week. "He was pretty sore today," said Reid. "We'll have to see how he does as the week goes on." Reid also stated Wide Receiver Riley Cooper was still inactive due to a fractured collarbone and won't be ready to play next Sunday. Reid then addressed the team's overall performance yesterday, in which they struggled to beat a team that was a heavy underdog. Reid first praised the team's overall defensive effort. "I thought defensively we came out and played very well," said Reid. "The defense set the tempo, played fast, furious and consistently tough football throughout the four quarters." Reid called the four combined interceptions from Kurt Coleman and Dominique Rodgers Cromartie "game changers that we needed to offset what we were doing offensively." Reid also praised the play of newly acquired linebacker DeMeco Ryans. "DeMeco I thought had a heck of game, which was good to see," said Reid. Reid then addressed the team's sloppy and inconsistent offensive performance. "Turnovers, turnovers, turnovers," said Reid. "We can't have those. I will say that we didn't play as disciplined offensively as we needed to all the way around." Reid was quick to not put all the blame on Michael Vick however, who was criticized for his performance yesterday in which he threw four interceptions, tying a career high. Reid also addressed the team's game winning 91-yard drive in the 4th quarter, referring to it as an example of what the offense is truly capable of when playing to its full potential. "It gives you an idea of what you can do offensively if you eliminate the penalties and you eliminate the turnovers," said Reid. "I think it was something that we needed. We've had a number of those games in the past when we weren't able to come back."